Singapore may be small in size, but it packs a punch when it comes to offering a range of unique and memorable experiences for travellers of all ages. For cruise visitors in particular, the Lion City makes an ideal destination for starting or ending a cruise, with its world-renowned food scene, great range of bars and restaurants, and diverse sight-seeing options, some of which come alive even more after the sun (and temperature!) drops. It’s important to note that Singapore may be small, but she has two cruise terminals – Marina Bay Cruise Centre (MBCCS) and the Singapore Cruise Centre (SCC). 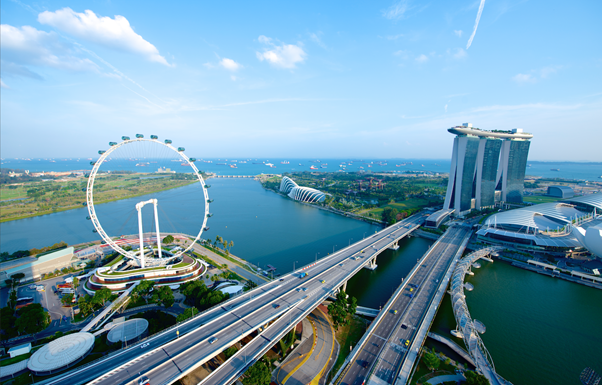 MBCCS is located closer to Singapore’s downtown city area, so hotels around Clarke Quay and Marina Bay areas are popular choices. Smaller ships dock at SCC at the Harbour Front Centre, next to Singapore’s largest mall Vivocity, and across from Sentosa Island (home to many attractions like S.E.A. Aquarium and beach-front dining options like Tanjong Beach Club). We’ve compiled the top 5 tips for Aussie cruisers, to ensure they experience the best of Singapore. Singapore’s tropical climate means it feels like summer all year-round, with temperatures averaging 30°C. The heat and high humidity mean it’s best to dress lightly to stay comfortable. You may choose to beat the warmer conditions by planning your outdoor and adventure activities for cooler mornings and evenings; or escape the peak heat in the refreshing domes of Gardens by the Bay, window-shop in underground walkways or hide out amongst the world’s largest display of Southeast Asian art at the National Gallery Singapore. You should also be prepared for rain showers, which can be heavy but usually brief, so carry a small brolly with you at all times! Singapore is famous for its authentic local fare, with over 100 hawker centres found across the island. Two of its famous hawker stalls have also been awarded Michelin stars – Hong Kong Soya Sauce Chicken Rice and Noodle and Hill Street Tai Hwa Pork Noodle, both selling traditional dishes starting from SGD$3. This makes Singapore home to the cheapest Michelin-starred meal in the world! If you find the lengthy queues at these stalls too daunting, you can still have authentic, delicious and equally affordable dishes from the other hawker stalls too. And don’t worry – all stalls are licensed and graded by the government on cleanliness and hygiene too. Connecting to the city from both cruise terminals is easy and will only take you about 15 minutes. The cheapest and easiest way to explore Singapore’s shopping, dining and attractions is via the MRT (Mass Rapid Transit) train system. You can buy tickets for single trips, but if you intend to use the MRT and bus services frequently during your visit, get yourself a Singapore Tourist Pass which allows you unlimited travel for 1 day (S$10), 2 days (S$16) or 3 days (S$20). Taxis are all metered and affordable, or you can opt to use a ride-sharing app like ‘Grab’. Bike-sharing is also growing in popularity and a cheap way to get around – check out Ofo, Mobike and SG Bike. With an array of events and festivals in Singapore all-year round, there’s always one that can fit into your travel plans once you step off the ship. Currently, visitors can take a walk on the wild side at Singapore Zoo’s Rainforest Lumina, experience the magic of Gardens by the Bay Christmas Wonderland or watch the city’s rich heritage and culture fill the streets of Chinatown in the lead-up to Chinese New Year. Chinatown Light-Up, January to February – Visitors can soak in the festive mood as locals prep for Chinese New Year. Singapore’s colourful and historical Chinatown neighbourhood will have an even more frenzied atmosphere when the streets are illuminated in the lead-up to, and throughout the 15 days following, Chinese New Year which falls on 5 February in 2019.